Some of these places are frequented by celebrities and influencers, others are more hidden and well known for the celebratory brunches they have hosted. 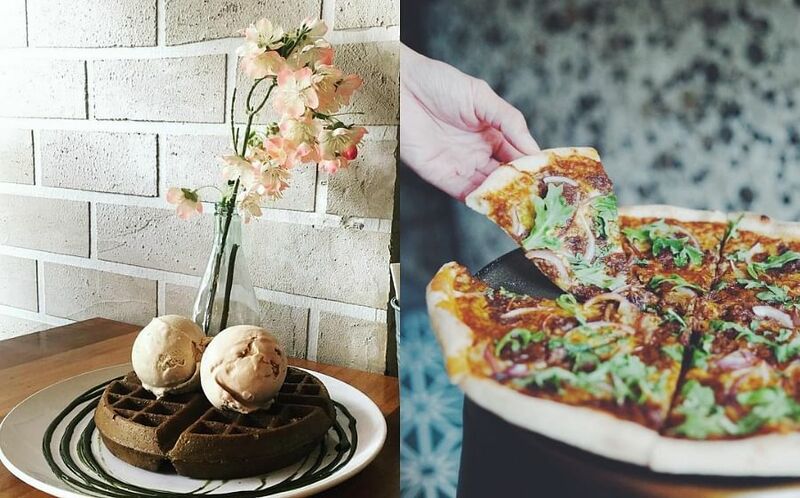 While it's common practice to meet up your girlfriends over the weekend for a quick coffee and croissant, initiate a nice, long brunch this weekend at one of these pretty spots in Singapore, your girlfriends will be thankful for that touch of atas on their Instagram feed. At 70-storeys high, Skai is possibly the tallest spot you can sit at and tuck into brunch in Singapore. Naturally, the views are exceptional from their grand floor-to-ceiling windows and the interiors are done-up in a minimalist classic style with warm, wood hues. Casual and classy is a theme that translates down to the brunch menu too — charcuterie and salads are served buffet-style, while the rest of the dishes arrive freshly prepared at your table. Buffet highlights include the Wagyu Beef Tataki with pickled eryngii mushrooms and ponzu and the Blackened Cod Fish with garlic, potato and sweet corn. Chef Chong Koo Jee who won the Singapore Pastry Cup 2018 is the maestro behind decadent desserts like the Chocolate Parfait with Earl Grey and chocolate honeycomb. This is a boozy brunch, so expect wines, champagne and brunch cocktails like the the Bloody SKAI (bacon washed T&T Wheat Vodka, dill Sherry, spice mix and tomato juice) to flow. Priced at $168++ per person, or $78++ for food and soft-drinks only. Skai is at level 70, Swissotel The Stamford, 2 Stamford Road, Singapore 178882, tel: 6338 8585. For brunch on the water’s edge, Prive’s Marina at Keppel Bay outlet is hard to beat. It boasts a casual, laid back vibe with views of the water, yachts and the futuristic Reflections at Keppel Bay towers. It’s also a family-friendly venue with a kid’s play corner and story books and art activities. The menu is a mixed bag of brunch staples like the Eggs Benedict with smoked leg ham and house-made bacon ($17), 10-inch stone-baked pizzas served half-and-half or whole, and even a few Asian mains. Their Hainanese Chicken Rice ($17) is an excellent version of the popular hawker dish, comprising plump slices of steamed free-roaming chicken, fluffy and fragrant rice and ginger and chilli sauces — all that deliver the desired punch. A walk along the marina post-lunch is great for boat-watching and photo ops. Prive, Marina at Keppel Bay is at 2 Keppel Bay Vista, Singapore 098382, tel: 6776 0777. For special occasion brunches, head to this Dempsey restaurant set within a restored Ebenezer chapel built in the 1930s. At The White Rabbit, food is classic European with modern touches, and the experience of dining in the colonial, high-ceilinged, stained-glass chapel with its stunning tiled floors, is an experience in itself. Brunch dishes range from the light Salt-Baked Beetroot Medley ($24) served with stracciatella cheese, wild honey and tomatoes on the vine, to hearty classics like the Classic Fish & Chips ($32) which uses hake fish. The accompanying chips are triple-cooked to decadence. Champagne and Gin cocktails are expected pairings at this laidback brunch. The White Rabbit is at 39C Harding Road, Singapore 249541, tel: 6473 9965. A meal at multiple award-winning Corner House feels like a special occasion right from the get go. 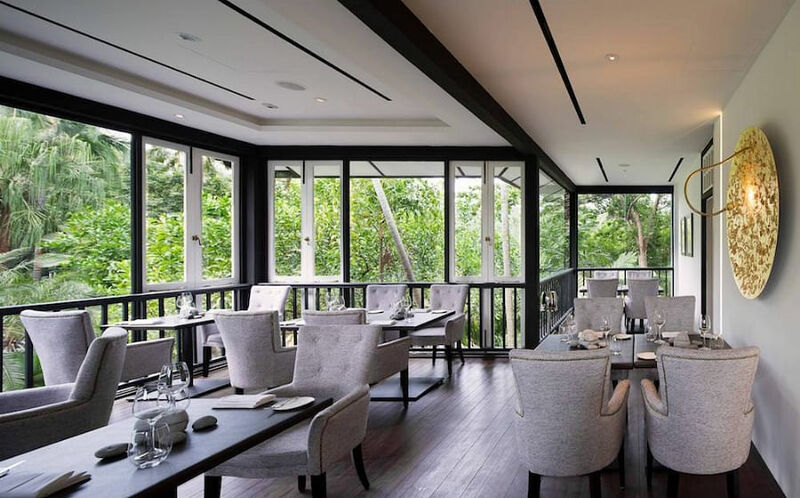 Set within a two-story colonial black and white bungalow inside the gorgeous Botanic Gardens, you are in for a treat with chef Jason Tan’s stellar menus. Fitting to its surrounds, the cuisine they serve is ‘Gastro-Botanica’ where contemporary cuisine is elevated with botanical elements; herbs, tubers, fruits, vines, greens and fungi. Food is served in courses, or as degustation menus. For weekend brunches, expect four courses ($98++) that include brunch-appropriate dishes like the 62 degree farm eggs with wagyu cheek, Jerusalem artichokes, shallots and croutons. Our favourite corner at Corner House is the verandah, where your table overlooks the gardens’ trees and dense hedgerows encircling the house. 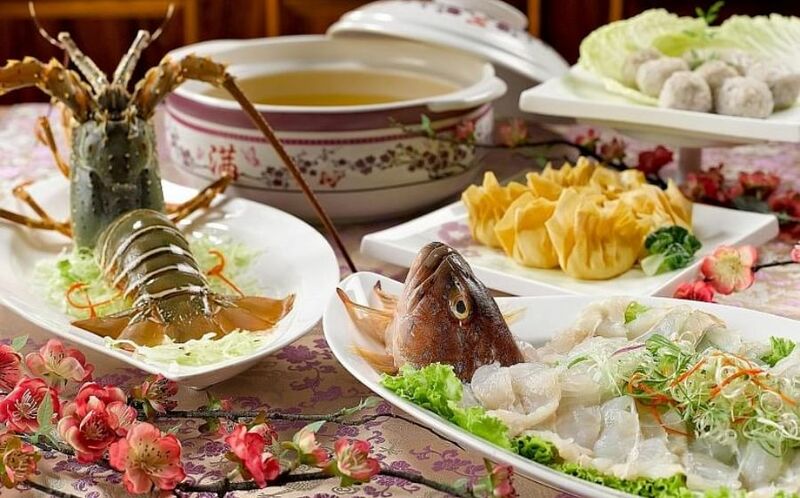 Corner House is at 1 Cluny Road, E J H Corner House, Singapore Botanic Gardens (Nassim Gate Entrance), Singapore 259569, tel: 6469 1000. Easily the most gorgeous CBD spot to have weekend brunch at, Caffe Fernet’s Custom House location allows you a waterfront spot and sweeping Marina views. The daytime vibe here is of relaxed, cocktail-laced brunches and their retro, leather couches are the perfect spot to sink into for a meal. Fernet’s contemporary Italian fare is light and easy, and will not have you feeling overstuffed. We highly recommend the perfectly executed Mafaldine Cacio E Pepe ($26) of handmade pasta, top notch parmigiano, pecorino and four kinds of peppercorns. There are also small plates like the Golden Beetroot ($19) served with goat cheese, wild rocket and chillies. They do excellent brunch cocktails, and is possibly the only spot in town to make Frosé (frozen, rose wine slushies). $55 will get you three-hours of bottomless pours of the Aperol Spritz, Watermelon and Strawberry Frosés. Caffe Fernet is at #01-05, Customs House, 70 Collyer Quay, Singapore 049323, tel: 9178 1105. Almost a year after the revamp of The Quayside area of Robertson Quay, Publico Ristorante continues to be the buzziest riverside spot with its casual Italian fare and breezy-meets-hip vibe. The decor boasts a tropical island vibe with lush green, shady trees and river views. Perfect for sun-drenched brunches (also, there is an equally pretty indoor area for those who don’t like alfresco). Top notch eats on the brunch menu are the pizzas (with 24-hour proofed dough made only from Italian flour) among which the Tartufata ($25) — a white pizza of smoked scamorza, porcini mushrooms and truffle oil — comes highly recommended. There are also salads, antipasti, pasta dishes and brunch-style eggs. Weekends also allow brunch goers three-hours of free flow Moet & Chandon Ice imperial, prosecco and rose for $110 per person. Publico Ristorante is at 1 Nanson Road, Singapore 238909, tel: 6826 5040. One of the forerunners for picturesque weekend brunches in Singapore, PS. Cafe’s Harding Road location is still going strong, and is still a top choice for celebratory weekend meals. It is open and airy, in a high-ceilinged colonial bungalow that looks out onto a field of green. PS. Cafe’s interiors are clean and uncluttered, with splashes of beauty lent by their signature, towering bloom bouquets. For brunch, expect hearty plates and signature dishes like their Green Goddess Pesto Penne ($26) which is whole wheat pasta, green vegetables and herb and pine nut pesto. Desserts are a must at a PS. Cafe brunch, and their staggering Chocolate Blackout Cake ($14 onwards) easily feeds two chocoholics. PS. Cafe is at 28b Harding Road, Singapore 249549, tel: 9070 8782. The entire Como Dempsey complex is elegant and beautiful, but the area that houses world-renowned Chef Jean-Georges Vongerichten’s Dempsey Cookhouse & Bar, is easily the prettiest. The all-white furniture and princess-like high backed chairs, the contrasting black and white floor, and the high ceilings signature to a Dempsey barrack — all add to its charm. Plus, the open bar with its lush green features are a particular highlight. Brunch mains range from the healthful Vanilla Chia Bowl with dates, cacao, brazil nuts and fruit ($14) to the indulgent Black Truffle and Fontina Chizza Pizza ($36). They also do brilliant brunch cocktails like the PIMM’s cup and Peach Bellini, served in glasses or carafes to share ($15 to $45). Dempsey Cookhouse & Bar is at 17D Dempsey Road, Singapore 249676, tel: 1800 304 5588. It’s a bit of a trek up to The Oval at Seletar Aerospace Park to have brunch, but The Summerhouse makes the trip worth it. Housed in a colonial bungalow that was once home to military and air force officers, this restaurant complex houses a floral studio, a cafe and a farm-to-table restaurant with its own farm and edible garden. The countryside feel, lush greenery and colonial decor all make this a highly picturesque brunch spot. Brunch is served in the second-level dining room, where dishes are cooked with ethically sourced, sustainable ingredients and garnishes are all from their own garden. Noteworthy dishes are the Mud Crab Omelette ($24) which uses mud crabs from a local fish farm and ethical cage-free eggs; and the Sweet Potato Leaves ($14) which are picked fresh from their garden and paired with charred zucchini and asparagus. The cluster of bungalows that surround The Summerhouse are also extremely pretty spots for a post-brunch stroll. The Summerhouse is at 3 Park Lane, Singapore 798387, tel: 6262 1063. Housed within the Botanic Gardens, Botanico and Bee’s Knees at The Garage sets expectations for beauty, simply because of their location, and beautiful it is. You come upon the art deco structure after a mini walk through the wooded part of the gardens and the colonial bungalow houses an outdoor terrace, an indoor restaurant and a garden bar — each with its own personality, and all equally stunning. Bee’s Knees is the cafe on ground level, which has an all-day menu with brunch-appropriate dishes (eggs, sandwiches etc.) but head to Botanico upstairs for an elegant brunch where the menu is varied to cater to a variety of tastes. Expect everything from petite brunch plates like the Polenta “Porridge” ($12) with flavours of coconut milk and palm sugar, topped with house-made muesli, candied bacon and fresh berries, and the luxurious Wagyu Beef Cheek ($32) served with burnt roots mash, parsnip chips and sautéed parsnips. Wooloomooloo Steakhouse has been around since 2012 and gathered a steady and loyal following for its consistent quality. With the launch of their new Surf and Turf five-course brunch menu, this restaurant is one of the most scenic spots in town for a weekend meal. The warm wood interiors are classic and elegant, but it’s really the expansive views from their floor-to-ceiling windows that are the draw. Snag a table by the windows for max effect. Brunch courses include luxurious nibbles like the trio of oysters with ponzu, mignonette and chilli vinegar and the duck rillettes with cornichons and toasted rye. Mains include stalwarts like the USDA prime 6oz of beef ribeye, served with pomme aligot (whipped potatoes with cheese) and confit truss tomatoes and their hand chopped steak tartare, with chives, a dash of truffle aioli and fried rye bread. Everything is well executed and for $68++ per person, the five courses are more than filling. The menu will change regularly, but will always feature both meat and seafood dishes in keeping with the surf and turf theme. Wooloomooloo Steakhouse is at Level 3, Swissotel The Stamford, 2 Stamford Road, Singapore 178882, tel: 6338 0261.